Women's Refined Slim Fit Short Rain Boots is rated 4.3 out of 5 by 65. Las botas de agua bajas Refined se reinventan con un exclusivo estampado de camuflaje que cuenta con la icónica silueta de Mary Poppins. 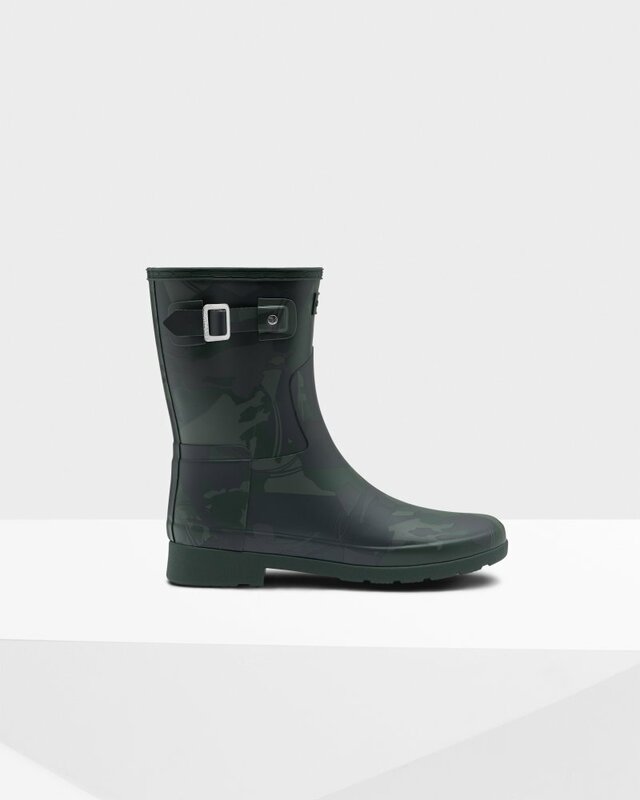 Una versión más elegante de la icónica bota de agua Original, esta bota impermeable y confeccionada a mano ofrece un ajuste más ceñido y personalizado. Además, se ha elaborado utilizando menos capas de caucho natural para aportar una sensación de mayor ligereza. Rated 5 out of 5 by Djones from Love love love! Love these boots! I’ve been holding off on buying a pair of rainboots just because I wasn’t sure if I was going to like them in general, but I’m so glad I got them. They’ve come in handy living in SF where it’s been raining a lot lately and I don’t have to worry about my feet getting wet. I normally wear a 7-7.5 and ordered an 8 in these. I originally ordered a 7 and felt that they were a little too small so went with the 8. Although they are slightly on the bigger side, I’m able to wear thicker socks with them and keep warm. Rated 4 out of 5 by fajardo13 from Great boots! I’ve always wanted to own a pair of these boots and I really love them ! Rated 5 out of 5 by Summercountry from Love these boots! I love the slim look. I am a petite woman and these do not make me feel like I am wearing goulashes. Rated 5 out of 5 by denise from Perfect boot I bought this for my 18 year old daughter and she just loves the fit and style. They are cute and easy to wear, with the lower calf. Rated 3 out of 5 by MyWay315 from Very Slim My partner bought me these boots around the holidays and although I like the color I'm not a real fan of the boots themselves. They fit my foot nice but are tight on my lower calve and ankle. Hopefully over time they will loosen up or I'll be forced to give them away. Rated 5 out of 5 by Niffler from Awesome I freaking love these. I got them in green. They look great. I have narrow-ish feet and wear an even size 7 and found them to be TTS. I can wear a pair of warm socks with them, no problem. I liked them so well I ordered the tall refined, too, but those were still too big around the calf. If you have very small calves, these are a great alternative to the taller styles. Also, they are a nice matte, dark green - they’ll go with anything and are a little more interesting than basic black.